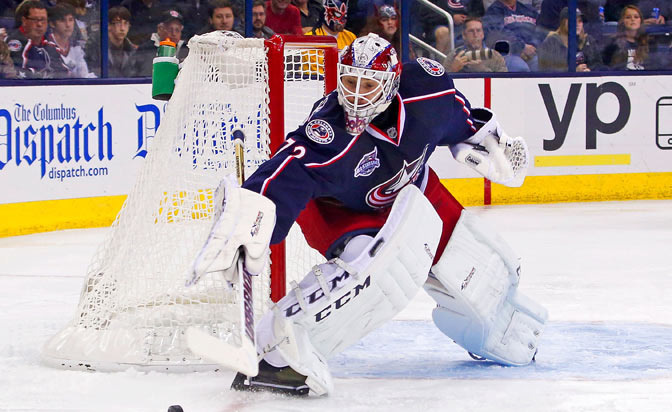 The news Tuesday that Columbus Blue Jackets goaltender Sergei Bobrovsky was placed on injured reserve with a broken finger and is expected to miss 1-2 weeks has some fantasy hockey owners on edge. Finding a suitable fill-in for the 2013 Vezina Trophy winner won't be easy, but there are some decent options available on the waiver wire to help ease the transition. It's a surprise Edmonton Oilers goaltender Ben Scrivens (Yahoo ownership: 37 percent) is not included on more fantasy rosters. The Oilers wrap up their seven-game homestand this week when the Nashville Predators and Vancouver Canucks visit, and Scrivens is in the midst of a four-game winning streak. Be sure to check back on Thursday when NHL.com correspondent Justin Goldman offers more in-depth analysis on Scrivens' hot play. In larger leagues with minimal access to legitimate starters on the waiver wire, you should consider scooping up a backup goaltender on a team with at least one back-to-back situation over the next two weeks. While there is no guarantee these backups will get a start in those scenarios, the chances of having them play at least once should increase. Put in a claim for Detroit Red Wings goaltender Jonas Gustavsson (Yahoo ownership: 7 percent) as the Red Wings play road games at the Ottawa Senators and New York Rangers on Nov. 4 and Nov. 5, respectively. The Swedish goalie has a win, 1.45 goals-against average and .935 save percentage in two starts this season. If you're comfortable with a more active backup, then Toronto Maple Leafs goaltender James Reimer (Yahoo ownership: 21 percent) is a sound pickup. Toronto has two back-to-backs over the next two weeks with a road game against the Columbus Blue Jackets on Friday, followed by a home game against the Chicago Blackhawks on Saturday, and then hosting the New York Rangers on Nov. 8 followed by a trip to play the rival Ottawa Senators on Nov. 9. Reimer is 2-1-0 with a 2.62 GAA and .914 save percentage in four appearances this season and should help your fantasy team bridge the gap until Bobrovsky returns.